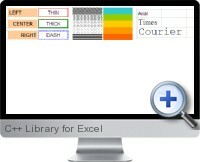 C++ Library for Excel allows direct reading and writing Excel files without requiring Microsoft Excel. The library can be used for Mac, Linux or Windows operating systems. Generate a new Excel spreadsheet from scratch. Extract data from an existing Excel spreadsheet. Edit an existing Excel spreadsheet. C++ Library for Excel can be integrated into applications for exporting and extracting data to and from Excel files with minimum effort. It can also be used ever as reporting engine. Can be used in C, C++, C# and other languages. Supports Excel 97-2003 binary formats. Supports Unicode and 64-bit platforms. Includes a wrapper for .NET developers and separate Mac and Linux versions. Simple interoperability without Excel dependency. Includes C/C++ headers and .NET assembly for including in a project without OLE automation. Customizing the look and feel by supporting numerous formatting options: alignments, borders, colors, fill patterns, fonts, merging cells and more. High performance: writing speed is about 2 100 000 cells per second for numbers and 240 000 cells per second for 8-character strings. Royalty free distribution within an application.